For functions sake, all that a container for aquatic gardening need do is hold water and not impact chemistry negatively. It might be a jar, aquarium, kiddy wading pool, pond, even a beached sail boat filled with water; all that's required is that the vessel be strong, durable and attractive. Additional considerations need to be taken into account for support and covering; aquatic systems are HEAVY, and present challenges and opportunities for constructing stands that are level, planar and strong. How big a system do you want? Remember your first apartment, motorcycle, computer hard drive? Bigger is better; a larger aquarium or pond is more stable, easier to maintain, and grants you greater flexibility in your underwater creation. Realistically, do get or build as much water space as you have room for; you won't regret it. No room for another tank? Here's a one gallon jar brimming with Echinodorus tenellus. Just place on a sunny window and voila! Instant water garden. On the other hand though, bear in mind that these things are massive, easily about ten pounds per gallon (and as a rule of thumb there are about 231 cubic inches per gallon, approximately 7.5 gallons per cubic foot). You want to allow for space to get around your system, and attendant water, drainage and electrical access. Shape is important, for light transmission, ease of your working in the system, and growth of your plants. Even neglecting absorption from suspended solids and color, reflection from the surface, shadowing by other livestock, being rooted in a deep system can be tough. More than eighteen inches of water over the plants, and you need to add more fluorescent lamps, boost them to High or Very High Output (HO, VHO), and/or consider metal halides. At two foot of depth, this is a certainty if you're dealing with plants that need "normal" to bright light. 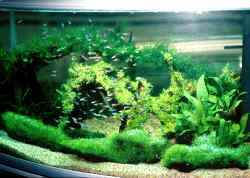 Besides, taller, narrower tanks are more expensive, harder for you to work in, clean and aquascape. Make mine wide. Larger systems may be constructed of concrete, fiberglass/resin & wood, or other structural elements with a clear viewing panel of glass or acrylic; though most stock systems offered in the trade are either entirely acrylic or glass and silicone rubber outfitted with a plastic frame. Around the world and even just in the United States there are folks who champion glass over acrylic; for safety and resale sakes alone I'm a bigger fan of plastics. Why do acrylic aquariums hold their value relative to glass? Easy; they're stronger than glass (about fifteen times) resisting breaks and rarely suffer leakage, better thermal insulators, easier to keep clean, clearer than glass, lighter, simpler to move... and in my opinion they look better. Also, if you're so inclined, acrylic tanks are also much easier to modify for gear by drilling, cutting. Yes, acrylic can be scratched; as can glass. 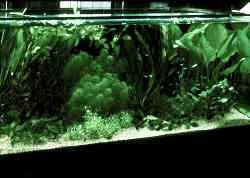 But you can also easily remove scratches, even serious gouges in acrylic; the same cannot be said of glass aquariums. But don't limit yourself to deliberating between glass or acrylic, or even just aquariums. 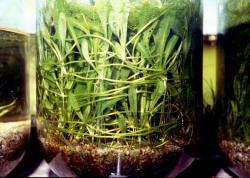 Live plants can and have been cultured in most anything that holds water. There are very few places people live where hydrophytes can't be grown out of doors for at least part of the year. My sister Donna has a converted mop bucket she grows tropical plants in much of the year; other friends support their "fishy habit" with back-yard culture using portable children's pools and more novel approaches. Where do you stand on stands? Should they be made of metal? Wood? Other stuff. Let's face it, whatever they're composition, they have three defining qualities; they must be level, planar, and strong, and on a floor that's likewise. Especially true with a glass system, the levelness of a tank is of concern. Aquariums as containers are engineered to resist forcers that are at right angles to their joints. Providing sheer forces, in particular ones that are unequal left/right, up/down, front/back is asking for trouble. As stated in the introduction, aquariums weigh approximately ten pounds per gallon set-up; in addition to what they're setting on. The tank and stand (or other supporting structure) mass must be held up evenly. For stick-like metal and wood legged supports, you can't be encouraged enough to provide a broad, flat, water-proof underpinning between the legs and floor. This might be as simple as a treated piece of plywood or one inch planks. Whatever you utilize, it is meant to spread out and equalize the force over a larger area that the bases of the stand. This is not for older wooden foundations only; concrete floors can be notoriously un-level. A related concept is plane-ness. Back to high school, this time math class. Remember, "two points determine a line, three points determine a plane..."? In our case we have an infinite number of points all the way around the edge of our aquariums. Ideally all these would touch their under-support equally. Imperfections in the tops of supports can often be detected by placing a stiff straight edge (like a long metal level) along their surface. Even if the surface does appear absolutely flat, do place a piece of foam, styrenes, thick cloth... under the tanks base as an extra precaution. Yes, your stand/support can be level or planar enough, yet not planar and level enough to support all edges of your system. Unlevel, non-planar-ness is one of the biggest no-no's for glass tanks. Acrylic is far more forgiving, but should be treated with the same respect. A final "support" concern is for safety against the system falling over. It is incredible how much an earthquake, sudden rupture, accidental banging can do to moving a massive object like an aquarium system. A real nightmare can be had by even a small child rocking a narrow-width system back and forth... By all means, make your system adequately secure by wedging it in three dimensions in your stand design or with other furniture; or better still substantial anchoring to floors and walls. A further word to those in earthquake and hurricane prone areas I trust is superfluous. Consider this- what's the worst that could happen? 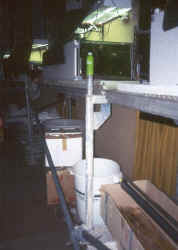 The tank could slosh out it's contents, including livestock onto the floor. The system and stand might "walk" across the room, crashing into where? It could get jarred partly or completely right off its stand/support, maybe even fall on someone. I've witnessed all these. A strong piece of furniture indeed! Make sure yours is supported underneath completely... as with upright two or four-bys. Shown: Commercial wooden aquarium stands in America and a fantastic temporary show set-up behind the scenes in Germany. What can be stated concerning tank tops and planted systems? All aquarium gardens benefit from having some open air space between their water and lighting. There are good reasons for some sort of sufficient cover; it reduces heat loss from evaporation, keeps curious hands and accidental objects from getting in, and more. My favorite concern is for piscatorial escapees; even angelfish and chubby catfishes can launch themselves out of a tank, unless the water level is lowered and/or it's covered. Aquarium manufacturers can custom cut a top to accommodate just your gear or sell you material for customizing your own. As mentioned, it's far better to leave your water level down a few inches than entombing your system with an air-tight cover. completely close off the system to some air exchange. Even large, well insulated systems should be put in areas that minimize environmental fluctuation; i.e. away from door openings to the outside, windows, heater vents. On the positive side, you'll obviously want to have the tank situated to optimize viewing; higher up for settings where folks will be walking by, lower for appreciation while sitting. Alternatively, tropicals and sub-tropicals can be grown outdoors in many places. Here's a giant Echinodorus rosaefolia swordplant growing in my friend John Pitcairn's backyard childrens' pool. You can be a wet-thumb success with any water-proof, chemically inert container. One that is adequately shallow, well-supported, properly sited, and covered makes the whole enterprise easier to operate and better looking. Keep an open mind when surveying "junk" yards, antique shops and yard sales; you never know where your next "aquarium garden" container will show up. 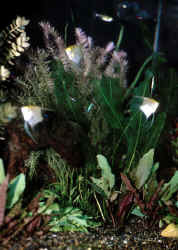 Some examples of halide lighted planted glass tanks. Agbayani, Nestor. 1995. Beam sizes for aquarium stands. FAMA 8/95. Anderson, Frank G. Siting your aquarium. FAMA 11/95. Bickmeyer, Walter. 1975. Build a cabinet for your fish tanks. TFH 6/75. Birdsell, Ben. 1988. Over the counter (on DIY glass tank construction). FAMA 11/88. Brosseau, Richard. 1992. How to build a heavy duty aquarium stand. FAMA 9/92. Fenner, Bob & Matt Tsunoda. 1988. Liners in water feature construction. FAMA 9/88. Fenner, Bob. 1994. Pond construction methods, pt.s 1-5. FAMA 5-9/94. Fox, Pat. 1997. Lining the pond; It's better than plastic or concrete. AFM 2/97. Gannon, Robert. 1960. Sturdy stand for battery of aquaria. TFH 4/60. Jonklass, Rodney. 1960. Concrete aquariums. TFH 10/60. Miller, John P. 1995. How to protect your aquarium against earthquakes. FAMA 5/95. Mortensen, Jim. 1995. Selecting a site for your aquarium. FAMA 2/95. Ostrow, Marshall E. 1979. Locating the aquarium. TFH 12/79. Randall, Karen A. 1998. Mini tanks. If you have some experience with aquariums, a tiny tank filled with plants can be a lot of fun. AFM 5/98. Richmond, Howard. 1983. Where to place your aquarium. TFH 5/83. Schiff, Steven J. Aquarium set-up; the aquarium. FAMA 12/92. Simon, Robert D. 1988. From start to finish (wood/glass tank construction). FAMA 4/88. Vecellio, Michael. 1988. How to build a stand for the large aquarium. FAMA 4/88.